The Queen, accompanied by The Duke of Edinburgh and The Duke of Cambridge, attended services to commemorate the centenary of the World War I Gallipoli Campaign and the sacrifices of Commonwealth troops, particularly those of the ANZAC (Australian and New Zealand Army Corps) forces. For more: BBC article and video, Zimbio gallery. Commemorations are happening around the world today, and in London, The Queen attended first a ceremony at the Cenotaph where she laid a wreath, followed by a service at Westminster Abbey. In addition to The Duke of Edinburgh, The Duke of Cambridge, and her Lady-in Waiting, Her Majesty was accompanied by her Australian private secretary Samantha Cohen. She wore the Palm Leaf, a.k.a. Paisley, Brooch from her mother's jewel collection today, always an appropriate selection for events like this. Hat switch! 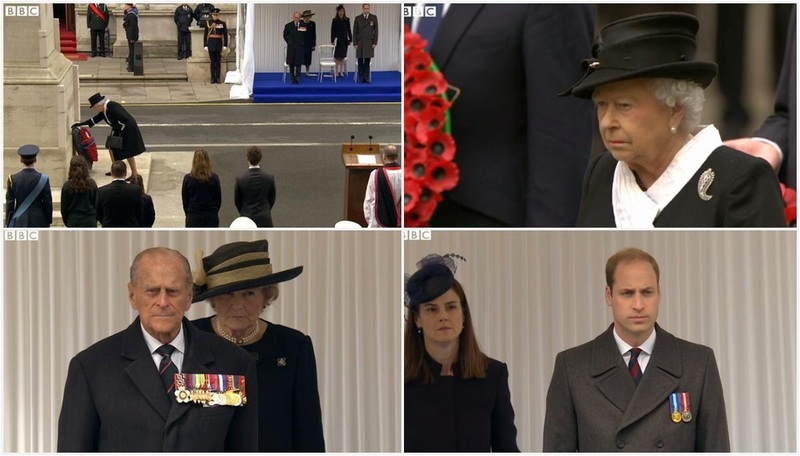 A smaller brimmed black hat was a more practical choice for the outdoor Cenotaph ceremony, before she switched into the wider brim white and black hat that belongs with this outfit. The Prince of Wales and Prince Harry have been in Turkey on the Gallipoli peninsula yesterday and today, where several events have been held. Joined by world leaders including the Prime Minister of Australia, they've met relatives of veterans, attended a dawn service, and even received some gifts from widows of Australian Gallipoli veterans. The Duke of Kent traveled to Australia, where he joined commemorations at the Australian War Memorial in Canberra. The Princess Royal and Vice Admiral Sir Tim Laurence attended a dawn service in London at Wellington Arch. And finally, beyond the British royal family, Denmark's Crown Princess Mary joined a service in Copenhagen today. Mary, of course, is from Australia. Click here for a video, or here for an article and picture (in Danish).